Unlike the SATs, this score may not measure how good you will be in college, but it does measure how you excel online and people may be using it to evaluate you. What score is this? It’s your Klout score. Klout is a free service where you can link all of your social media accounts to one profile. Klout then generates a number or “score” for you based on how many interactions you have online, ie: how many posts, retweets, favorites, likes and tags you make, create or have. The score can go up and down as the above determining factors change each week and each month. The goal obviously is to steadily increase your engagement, your followers, and your mentions/tags in order to become more “influential” online. That’s how Klout sees it anyway. The higher the score the more influential YOU are. This is what you would see if you searched for my Klout: I have a score of 73. Not bad, but obviously still some room for growth! When you first sign up don’t be alarmed or dismayed if your score is in the 20’s or 30’s. With just a little bit of engagement and effort you can start to move the needle in the right direction. • Klout helps you curate valuable content to market to your niche. You are able to create, via the “create” tab, posts that are relevant to your audience that Klout suggests for you. You can pick amongst shareable articles or post your own. • Klout helps you find others in your business niche that you might want to follow, friend, or engage. It does this in a few ways. You can use the search function and type in someone’s name who you have had your eye on in your business realm. This will pull up the screen shot I posted above and show you their score. Influencers are good to know and be a part of their world because by engaging with them you engage their large audience too. 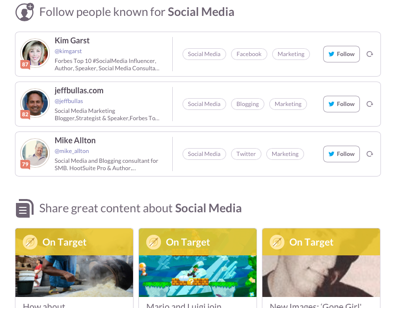 • Klout suggests influencers to you based on the topic you pick (these topics are all related to your own business niche), shows you top three influencers, their Klout score, their twitter feed and allows you to follow them right from that screen. You can hover over their profile to get an idea of the size of their audience. With this same feature Klout also suggests trending articles and popular content to share about that same topic allowing you to find influencers in your field, share content and tap into their audience all in one fell swoop! From the above screen I can follow Kim, Jeff, or Mike and share an article that (according to Klout algorithms) my followers find interesting. Remember, though we may say Klout measures your “influence” that number means nothing if you don’t engage, respond and reach out to people in your sphere. • Use Klout to find people to follow and engage their audience that is similar to what you want yours to be. 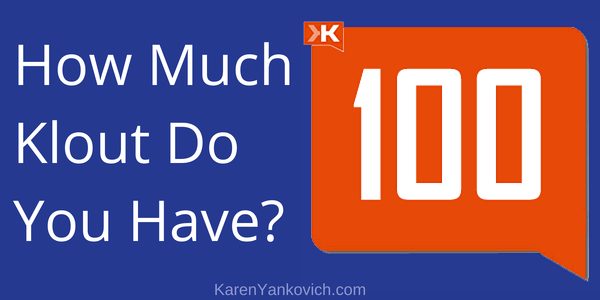 • Use Klout to gauge your success. Are your efforts working? Is your score increasing? Or do you need to rethink your tactics? • Use Klout to get inspired on what to share and when, which we all know can be a bear when handling many platforms at once! So what’s your Klout Score? Is it higher than mine? Let’s share and compare! Join myself and others like yourself in my LinkedIn group who are getting a handle on the social media side of their business. Click here and be a part of the community! I look forward to seeing you in the group. Karen this is like a fitbit for entrepreneurs. Instead of counting steps or calories, it counts in the currency of social media. What a great concept. For competitive people or just those who like to measure their progress, this is a great service! Thanks for bringing it to our attention. I like that Lorna! Fitbit for entrepreneurs. This seems like a great service to break down the mystery of social media into manageable bites. If I borrow Lorna’s idea of seeing it as an S.M. fitbit, it makes it seem more like it’s helping me track, rather than giving me one more thing to feel like I’m not making the grade. It really IS all about tracking. It simply gives you some idea of where you ARE. What a great tool! I think this may be a great new goal, increase my “Klout” score bit by bit. I always love the tips and tools you have to share! It’s not easy to increase it Cathy! I can pop mine up, but then it creeps back down to 72ish. But interesting stuff. Karen, I had completely forgotten about Klout until you mentioned it on LinkeIn a few weeks ago. I don’t think I had checked my score in 2 years or so. I am so thankful that you resurrected Klout for me! When I checked back in, my score was 40, but only fb and twitter were linked. I linked my other sm accounts, and voila! A score of 60! It was up to 62 last week, but after unplugging a bit for a family matter, it’s down a point at 61! Thanks for the explanations above. It’s good to learn of the features at our disposal. You know what Michelle, at some point someone ELSE is going to look at your Klout score, and may make some judgments about your business. So we need to know what’s out there with our name on it! interesting, karen! thanks for alerting me to this handy tool (i hadn’t heard of klout before). i’m curious to see how i’m showing up in the world of social media . . .
Y Klout score has stayed in the high 60’s forever. Throwing my hands up?! LOL it’s not worth stressing over! It just IS.